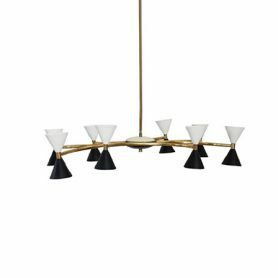 Brass chandelier made in the 50s by the Stilnovo company. It has 8 arms and 16 light sources: the lampshades resemble a two-color (white / black) hourglass with a double light source. Stilnovo is a Made in Italy fashion company for civil and industrial use founded in Lainate in 1946. Rare set of applique from the ’50s/’60s produced by the Made in Italy company Stilnovo. Stilnovo is a Made in Italy lighting company founded in Lainate in 1946. 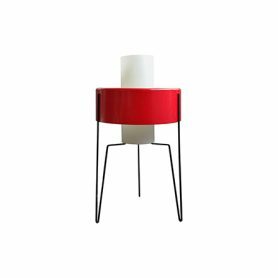 Table lamp by Stilnovo is a 50s vintage design object with a geometric shape. 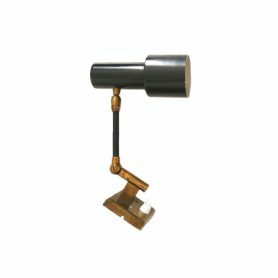 Stilnovo is a lighting Made in Italy design company for civil and industrial use founded in Lainate in 1946.